Let’s start with the truth. In a March 13 report, the CBO gave updated estimates for the cost of insurance coverage provisions of the law for the 2012-2021 period. It said the gross cost — not including revenue measures — would be slightly higher than it had estimated a year earlier, in March 2011. The latest estimate puts the cost at $1.496 trillion over that decade, up by about $50 billion, which is a 3.5 percent increase. The latest estimate of year-by-year costs is also higher than what was originally estimated two years ago, when the bill was enacted. The latest estimate covers only eight of the years (2012 through 2019) that are in the original estimate. The total “gross” costs of that eight-year period are now estimated to be just over $1 trillion, or about 8.6 percent higher than originally projected. But the CBO also projects that much of the new spending will be offset by penalties paid by employers who choose not to provide coverage to their workers, by penalties paid by individuals who opt not to obtain coverage, by taxing high-cost health plans and by other effects of the law’s coverage provisions. After accounting for these offsets, the “net” cost of the coverage provisions are now expected to be somewhat lower than projected two years ago. Comparing the eight years that are common to both estimates, the net cost is now predicted to be $772 billion, or about half a percent lower than originally estimated. Conservatives quickly jumped on the new CBO report, falsely claiming it said the cost estimates were now double what the CBO originally estimated. And the conservative news outlet Newsmax ran a headline saying, “Obamacare’s Gross Costs Double to $1.76 Trillion, CBO Projects.” An Internet search turns up many conservative blog reports making a similar costs-have-doubled claim. But the law’s costs haven’t doubled, and CBO didn’t say they did. That claim results from an inappropriate apples-to-grapefruit comparison. The original gross cost estimate – at $938 billion over 10 years – was for 2010-2019. CBO’s latest $1.76 trillion estimate is for 11 years, ending in 2022. In the chart below, we compare only apples to apples — the eight fiscal years covered both by the 2010 report and by the latest report. (See Table 2 in the latest report, and Table 4, page 24 in the 2010 report). And as you can see, the estimate of gross outlays have crept up since the original projection — which the CBO said is due in part to an economy that is recovering more slowly than originally projected. But the net costs — after accounting for revenue measures related to insurance coverage — have declined just a bit. The gross costs of the insurance coverage provisions include federal subsidies for lower-income individuals to help them purchase insurance, expansion of Medicaid eligibility and tax credits for small businesses that provide coverage. CBO’s net figure includes a few related savings measures — an excise tax on high-cost health plans offered by employers and penalties paid by certain employers not offering insurance and individuals who don’t buy it. 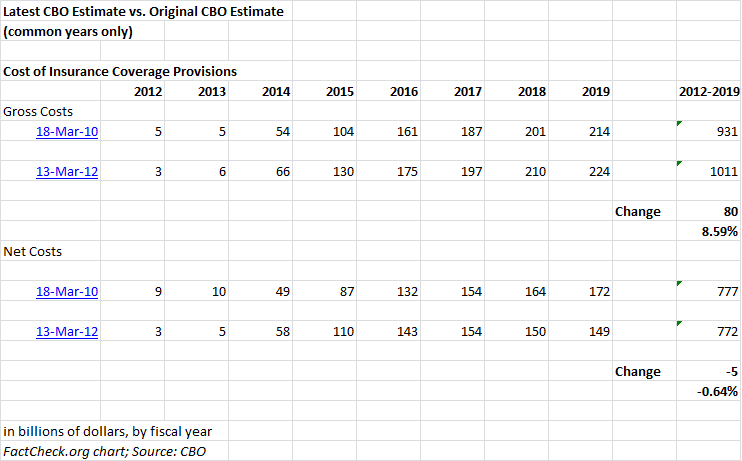 The 11-year figure is much higher than CBO’s original 10-year estimate because it includes three additional years of full implementation of the coverage provisions of the law. The federal subsidies and expansion of Medicaid, which are by far the most costly elements of the coverage provisions, don’t go into effect until 2014. So, that 2010-2019 estimate includes four years of very low coverage costs (relatively speaking), and the 11-year estimate only includes two years of very low costs, plus three extra years of full implementation costs. Republicans and budget watchdogs complained back before the law was passed that it wasn’t fair to estimate the cost by including several years in which some of the revenue-raising aspects of the law were implemented but the full costs weren’t. We wrote that the critics had a point. Maya MacGuineas, president of the nonpartisan Committee for a Responsible Federal Budget, told us that the timing “masks the true differences in the cost.” But she said that something this large “can’t possibly get put into effect full force” immediately. The CBO said these adjustments in estimates are due to new laws that were passed, changes in the economic forecast that predict a slower recovery, and slower predicted growth in private insurance premiums. These gross and net costs for coverage provisions don’t include other elements of the law — such as major cost-cutting provisions including cuts in the future growth of Medicare and increased payroll taxes and investment-income taxes on higher-income earners. Once everything is factored in, CBO has estimated that the law would reduce the federal deficit by $210 billion over the 2012-2021 period (see Table 1, page 2). CBO did not update that overall figure in its latest report. So it would be fair to say that CBO now estimates that the law is going to be more expensive than originally thought — about 9 percent. It has always been fair to say that the original $938 billion projection only covered the 10 years after enactment (the usual convention for such cost projections) and not the 10 years after the law becomes fully effective. But the notion that the new CBO report shows costs doubling is wrong. Correction, March 19: We have corrected our original article to retract a statement that Sen. Jeff Sessions of Alabama misquoted CBO. He did not. His statement referred to President Obama, saying that “President Obama told the American people his health law would cost around $900 billion over 10 years.” Sessions then used the CBO report to argue, once again, that the costs when fully implemented will be higher. We regret the error.